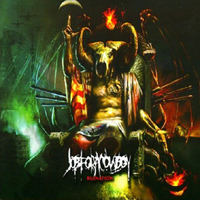 One of the great big hopes for death metal in the 2010’s is Job for a Cowboy (JFAC). I’ve felt that way since I heard their music for the first time. Even great big hopes sometimes fail to deliver, I’m afraid… This is going to be a somewhat middling review, but unfortunately it suits this album. During the last couple of years the metal underground has been exposed to two fantastic albums – Doom (2005) and Genesis (2007) – that proved that death metal, math-core and groove metal belong together. Songs like “Knee Deep” and “Reduced to Mere Filth” set new standards for the R&D-department of the extreme metal scene. JFAC masters the dizzying break techniques of Psyopus, while keeping the pace of traditional death metal onslaught. They preserve brutality with one of the best growling vocals the world has seen – the honorable Johnny Davy - and thundering speed-drumming, while weaving intricate patterns into this blood red fabric with astonishing guitar riffs. All this holds true for the new album, Ruination, but regrettably everything has been tuned down a bit. What one thought was a flirt with the heavy duty past of Morbid Angel and Coroner, on Genesis, turned out to be the first step towards the mainstream. It gets worse on Ruination. The album holds fewer surprises, lesser aggression. To catch all the details and delicate features of Doom, one really had to listen carefully. With Ruination one wonders if it really is worth the time needed to pinpoint the few delicacies. Ruination is an “ok” album – I really hate that term! It won’t scare anyone away from either the band or the genre. But it lacks the powerful inflaming originality of the earlier albums. The rating represents my disappointment caused by this lack (thus, is based on my expectations), and metalheads that has never heard the band will probably think it is a great album. I feel JFAC let me down a bit. The rating is raised though, by the superior growling and the drumming.